SINGAPORE- Top players from the Asia-Pacific region traveled to Singapore this week for the WTA Future Stars Tournament. The finalists for U-14 and U-16 had the opportunity to play their championship matches on Centre Court of the Singapore Indoor Stadium. Violet Apisah of Australia defeated Shivani Amineni of Indionesia in a close encounter, 7-5 6-4, to take home the U-16 Future Stars trophy, while Japan's Shiori Ito came back to win the U-14 trophy in a tiebreak, 4-6, 6-2, 10-3 over Uzbekistan's Olesya Kim. After the finals, WTA Legends Yayuk Basuki and Tamarine Tanasugarn, along with WTA CEO Steve Simon helped award the winners at the WTA Future Stars trophy ceremony. 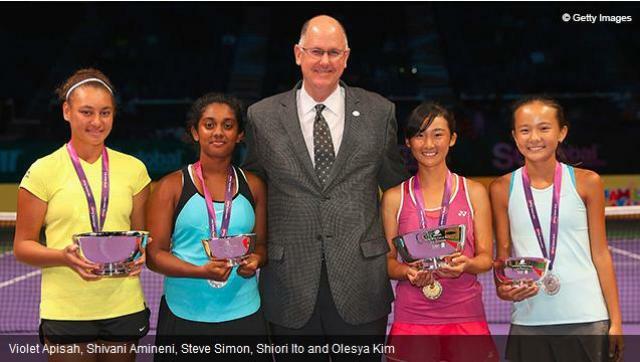 Congratulations to U-14 champion Shiori Ito of Japan and U-16 Violet Apisah of Australia. Also, Alex Eala of the Philippines and Uma Nayar of Malaysia were honored with the 2016 Li Na Inspiration Award during the ceremony.